Strawberry Swing and other things: Better Late Than Never! I realized I never did a comprehensive look back at my second pregnancy. I mean why take all those weekly photos if you aren't going to make a giant collage to compare your growing bump... with hoards of internet strangers who probably could not care less, but you guys are my friends, right?! 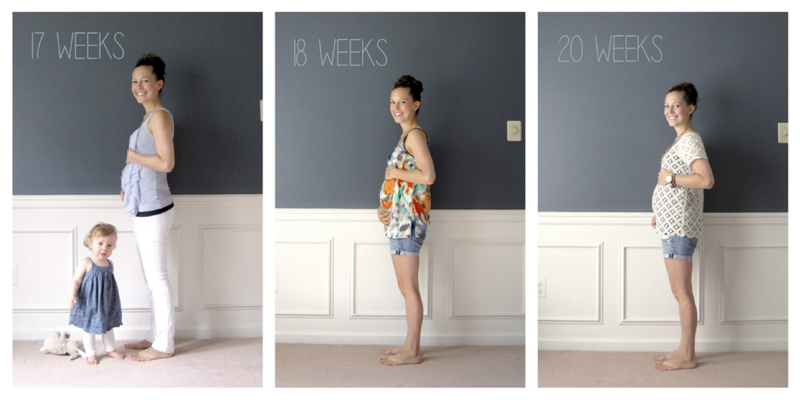 Anyway, I'm a bit too far removed (um, over 4 months) from my pregnancy to recap the last month. I remember being extremely uncomfortable, loads of heart burn that would keep me awake at night, and just in a lot of pain trying to keep up with an active toddler on the daily. I remember wanting to meet her so badly after we past Ashlynn's 35week birth, and she made me wait 4 more weeks! Of course, it was all worth it.... just look at the little bundle of cute we have now! I said it before and I'll say it again. You do pregnancy adorably. No joke. Super jealous as we kinda sorta a little start discussing having another and I know I'll be whale status by week 14 and your adorable the whole way through! Cutie! And the baby is super cute too! ;) PS Love the way you did the photos and love your daughter in some of them! Adorable! <3 Love the transition :) You were all belly! How fun, big sister's appearances are the cutest. Good job on keeping up with them all throughout!! 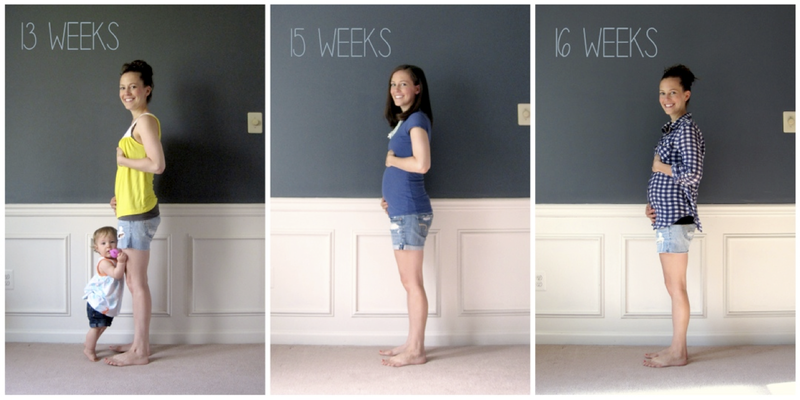 It's never too late for a pregnancy photo timeline! You the cutest lady, Erinn! You looked fantastic pregnant! 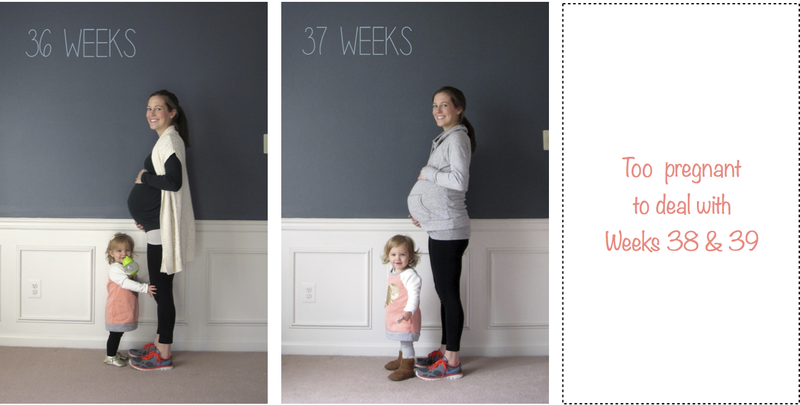 I love how Ashlynn is standing in the 37 week picture -- just like mama! And not a single outfit repeat? Please tell me you planned it that way! I love the 37 week picture with Ashlynn! She looks like a little model posing :) Also, I am impressed with your adorable fashion throughout your pregnancy! I lived in gap tshirts. Not nearly as cute! I love this! Too cute! Thanks for sharing. What a great collage! I'll admit I never did that because IDK how to line them up like that! Love Ashlynn's' growth and appearance in so many pics too! Definitely the best is the last pic though! ;) What a great bundle of joy! Love baby #2's name, she's adorable! And you are the cutest preggo! so cute! can't believe you made it to 39 weeks!